Babe Ruth signs a few balls on the dugout steps c.1930. Over the past few decades, baseballs alleged to have been signed by Hall of Famer George Herman “Babe” Ruth have become the most prized collectibles in the billion-dollar baseball memorabilia industry. Many credit Ruth-related artifacts as creating the foundation for the baseball memorabilia craze that was initiated by the Bambino as he pushed his hand and pen across thousands of fresh white horsehide baseballs that have since become family heirlooms and highly marketable assets for both collectors and investors alike. The most striking example of the power of the Ruth signature is the record-breaking auction sales figures generated by the near-mint condition examples of the Babe’s autograph that have survived. Looking like they did on the day they were allegedly signed by the Babe over a half century ago, the top dozen balls sold privately and at auction have generated over $1 million, with the highest-graded specimen changing hands recently for a reported $300,000. 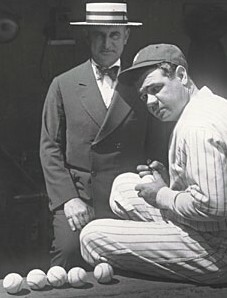 For many years Ruth balls had typically changed hands for thousands of dollars at auction, but in 1999 an example sold by Barry Halper at Sotheby’s realized a hammer price of $46,000, a world-record at the time for a baseball signed by the man who first set the standard for breaking baseball records. Halper chose Sotheby’s to sell off his entire collection, which was said to have included over two-hundred baseballs signed by the “Sultan of Swat,” and the final tallies also broke records with hammer prices exceeding $20 million. Sotheby’s said that the Ruth ball that broke the sales record had always been Halper’s favorite. Soon after Halper’s Ruth ball hit the high five-figure milestone, a steady flow of comparable balls in pristine condition began surfacing in major sports auction house catalogs and Halper’s Ruth record was soon eclipsed by several sales that established new marks that pushed the Bambino balls closer to the six-figure range. Operation Bambino is the current Haulsofshame.com investigation seeking to determine if these record-breaking balls sold at auction were actually signed by the Babe, or are forgeries. In this third installment of our 10-part series we will compare exemplars of genuine Babe Ruth signatures with the alleged autographs of the slugger found on the sweet-spots of eleven of the most valuable Ruth balls in the hobby. (Left) Genuine Babe Ruth signatures signed from 1934 (top) to 1948 (bottom). 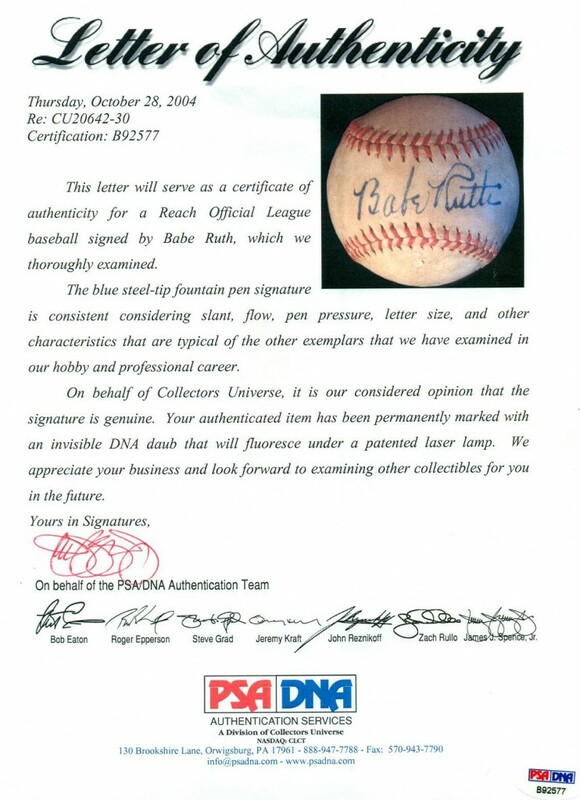 (Right) Alleged Ruth signatures that appear on the record-breaking single-signed Ruth balls sold by major auction houses from 1999 to 2011. The sales of these eleven balls have generated well over $1 million in revenue. 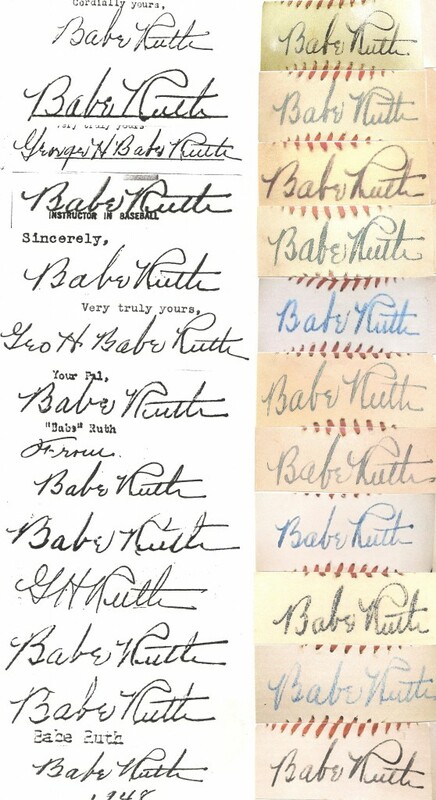 The genuine Ruth signatures (left) featured alongside the alleged Ruth autographs on the near dozen record-breaking Ruth balls (right) show considerable contrast. The genuine signatures utilized in our illustration span from 1934 to 1948 (the year of Ruth’s death). Most of the record breaking Ruth baseballs sold at auction were signed on official American League baseballs bearing the facsimile signature of league president William Harridge and were produced between 1934 and 1948 as well. The authentic exemplars of Ruth’s signature on the left include: 1.) 1934 letter to Col. Jacob Ruppert (Lelands); 2.) 1935 letter to Miss E. Lazarow (Lelands); 3.) 1939 agreement with NBC; 4.) 1940 World’s Fair Baseball School Certificate; 5.) 1942 Letter to Georgie Henry; 6.) 1943 Letter to Wm. H. Pfau (REA); 7.) 1944 Letter to Vern Haas; 8.) Photo c.1940s; 9.) 1946 Postcard Correspondence to Chas. Weber (Heritage); 10.) 1946 Endorsed Check to Claire Ruth; 11) 1947 Postcard Correspondence to Chas. Weber (Heritage); 12.) 1948 Letter to Dan Topping (Sotheby’s Halper); 13.) 1948 Inscribed copy of the Babe Ruth Story to Roy Del Ruth . The signatures on the right side of our illustration are featured on the record-breaking Ruth balls sold at auction and in private sales: 1.) 1999 Halper sale Sotheby’s $46,000; 2.) 1999 Mastro Fine Sports $56,500; 3.) 2000 Robert Edward Auctions $48,048; 4.) Robert Edward Auctions $76,021; 5.) 2000 Hunt Auctions, Mastro and Private sale (2005-11) ranging from $70,000-$300,000; 6.) 2004 Grey Flannel $41,672; 7.) 2004 Grey Flannel $44,438; 8.) 2005 MastroNet $87,720; 9.) 2007 Mastro $23,266; 10.) 2008 Heritage $50,787; 11.) 2010 Heritage $83,650. In our two previous installments we reported that in regard to the eleven record-breaking balls included in our illustration, expert Ron Keurajian stated there was, ”not one (he) would feel comfortable in pronouncing as genuine.” We also noticed that the many high-grade Ruth balls sold appeared to have been executed in multiple hands. Both JSA and PSA also state that it is their “considered opinion” that the examimed signatures on the baseballs are genuine. This letter of authenticity was issued by PSA/DNA and their lead authenticator James Spence in 2004. The LOA's issued by PSA and JSA are non-specific form letters that rarely give any insight or expert analysis in regard to the signature in question. It is believed this ball PSA authenticated is a forgery. It is not known what exemplars of Ruth’s signature were used by PSA and JSA in determining the authenticity of these eleven baseballs. Based upon the suspect authentications of so many questioned Ruth balls it is possible that so many forged Ruth balls have made their way to the marketplace that the Ruth forged signature has eclipsed his genuine signature as an exemplar for the current leading authentication companies. In 2012, the findings of Operation Bambino will be published including the opinions of respected handwriting experts and analysts as to the authenticity of the Ruth signatures in question on the record-breaking baseballs. What is your opinion? Feel free to email us at Tips@haulsofshame.com or leave a comment below. very interesting article. I think you are on to something. Those balls are so white and pristine, it defies logic that they could look that clean after all these years. I just wish you would have shown some examples of real Ruth signed balls for comparison. Thanks. We will be showing comparisons of those balls against others believed to be authentic in the upcoming reports. We wanted to establish as a starting point a comparison against unimpeachable exemplars including legal and financial documents and other documents that could show the progression of Ruth’s signature year by year from 1934 to 1948. After looking at these forgeries,I wonder how the people who were duped out of all their hard earned $,s feel about it now.I for one, would be out for blood and would surely be knocking on the auction house doors ,for my $ back.I cant imagine paying ,lets say 20-40 big ones ,for something that is worth the price of the blank ball,disgusting. People have to wise up. Many I know who have bought these bogus balls will swear to it… so they want someone to back up what they think they have …will pay to get “papers” on it…and continue to fool themselves, papers do not make it so. When does this madness stop? You want to own a piece of my grandfather? Do some of the random acts of kindness he did. You will be as close to him as you can get….oh yeah..there’s no money in that!